Continuing my shopping trip, on from Primark I went to Superdrug. I had a small list of what I wanted, but seeing as the 3 for 2 offer was on, it didn't quite go to plan..
First up was these Rimmel Salon Pro nail varnishes. I bought my first Salon Pro nail varnish around two months ago now (review here) and I absolutely adored it. It has a really good finish and longevity so I really wanted to pick up some different shades. From left to right, is shade 312 'Ultra Violet' and is a light purple colour. I currently have it on my nails now and I was hoping it to be a bit more of a pastel shade when I originally picked it up, but it's lovely all the same. Next is shade 411 'Navy Seal' which is blue/grey colour, which is not quite navy and lastly shade 313 'Cocktail Passion' which is a coral/pink colour. The only item I went in Superdrug to buy was Rimmel Scandaleyes Mascara. Last time I bought mascara I had a little bit of money as it just been my birthday and I splashed out on the Benefit They're Real mascara and to be honest, I really wasn't too impressed. Therefore, I thought I'd just stick to high street brands for now so I wouldn't waste my money again if the mascara turn out to not work for my lashes. I've been wearing it the last few days now and so far so good! I use this one for thickening my lashes and another one for length. The next thing I picked up was Collection's Lasting Perfection Concealer in 'Light'. The concealer I previously used was just a little to light for my skin tone, so I picked this one up after hearing lots of good reviews about it and for the price, you can't go wrong. Finally is another Rimmel Kate Moss Lipstick, I need to stop buying these seriously. I picked up shade '107' which is a really lovely deep berry colour. 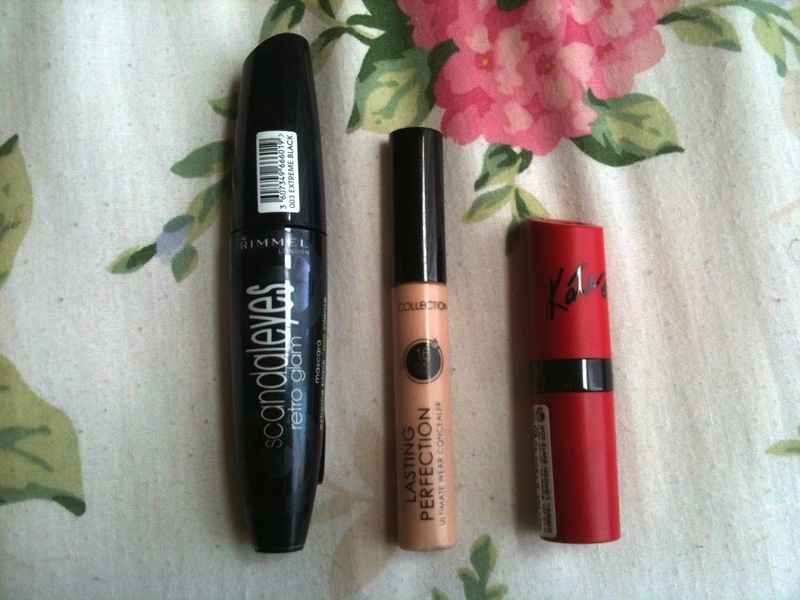 So here's a small haul of what I picked up when I visited Superdrug. Do you own any of these items?